My previous post on Atlanta housing shows rental prices by neighborhood and their five-year trend. This post uses home price data from Zillow to look at an eighteen-year trend. I'll also explore the divide between southwest and northeast Atlanta and racial income gaps. 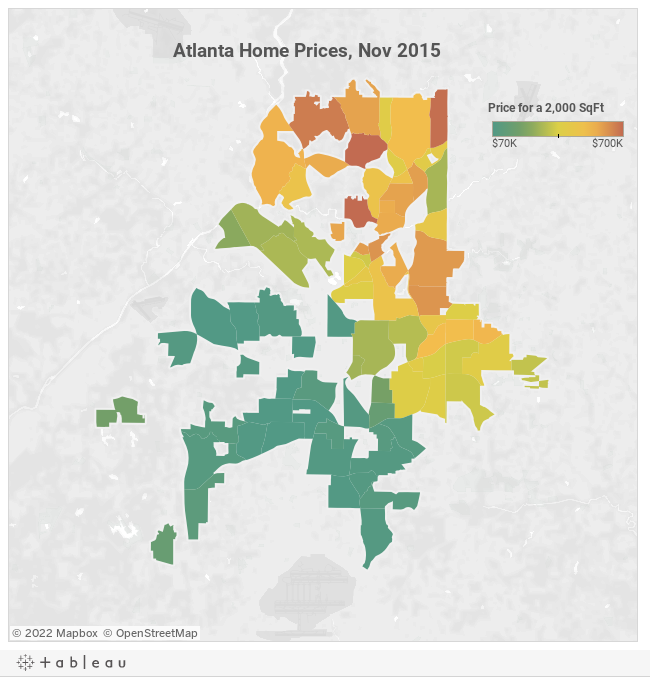 First, a map of home prices in Atlanta, as of November 2015. This map was created using price per square foot data from Zillow and multiplying to estimate the average price for a 2000 square foot home. Blank neighborhoods do not have data in the Zillow dataset. As expected, the map looks similar to the apartment price map- neighborhoods with expensive homes tend to have expensive apartments. The graph below demonstrates this by graphing home prices against apartment prices. This graph is helpful for understanding the data set. Neighborhoods above the trend line, like Midtown and Downtown, have high rental prices relative to home prices. This could be because rental stock that is nicer than home stock, or because many homes in these neighborhoods are condominiums, and are less expensive on a price per square foot basis because they have condo fees and less land per resident than a traditional home. The home price map also shows a striking divide between Northeast and Southwest Atlanta. The graph below investigates this by graphing the home price for the two halves of Atlanta. All prices are adjusted to 2015 prices using the CPI. The Southwest rose by more on a percentage basis from 1998 to 2006- 62% compared to the Northeast's 38%. But home values in the Southwest then fell by 59% during and after the recession, while homes in the Northeast only fell by 31%. The Northeast homes are now only 8% below their pre-recession high, while Southwest homes are 57% below their pre-recession high. The larger price swings in Southwest Atlanta were caused at least in part by federal programs. Both Presidents Clinton and Bush led programs designed to increase home ownership among low to middle income households, and Bush specifically targeted his program towards minorities. These programs increased prices in low-income neighborhoods by creating increased demand, and the lax lending rules put the neighborhoods at a greater risk during a recession. The less educated were also more likely to lose their jobs during the recession, compounding the problem. The unintended consequences of the home-ownership programs is similar to the problems with affordable housing programs described in my previous post- they are well-intentioned programs designed to help the poor and middle class, but end up making the average person worse-off because they distort the market. Back to Atlanta: The video below shows how each individual neighborhood changed from 1998 to 2015. For those interested: click here for the interactive graph version of the above video. Or click here for the video (or graph) that shows growth to 2015 over time (instead of growth from 1998), which I think is less intuitive but more relevant. Comparing Northeast and Southwest Atlanta raises the question of race- the Northeast half is mostly white, and the Southwest half is mostly black. The graph below shows median household income for blacks and whites in the city of Atlanta, as well as the Metro area and the country. The income gap for the city of Atlanta is depressing. Blacks in Atlanta have noticeably lower incomes than the national average for blacks, while whites have higher incomes than the national average. This situation is unique to the city proper- in Atlanta's metropolitan statistical area, blacks have a higher income than the national average. Related to this topic, one thing I think could use more clarity is the relationship between luxury construction and gentrification. If gentrification is defined as an area's mean income, rents, etc. rising from wealthier residents moving in, that can happen either through displacement, new construction, or some mix of the two. Often displacement is what folks get most worried about. It is concerning to think that people who have lived in a community for some time are not able to continue doing so because of changes happening around them. In lamenting that new construction is expensive, the articles you point to seem to be misinterpreting the reality of new (luxury!) construction's relationship with displacment, which you hint at in point 4 on your list of takeaways. Michell Eloy at WABE: "But low- and middle-income renters – renters like Huftalen – say they feel increasingly squeezed by the market, unable to afford the new luxury apartments and edged out by stiff competition and equally high prices for older units." The point Eloy fails to make is that were it not for new luxury apartments, the high prices for older units would have risen even more (more on that in a second). Editorial Board at CL: "But left unchecked, this environment could create a frightening affordability crisis where, years down the line, Atlanta is only a place for the well to do. That's how affordability crunches happen — developments get rolled out, the city's population grows — and boom — you're suddenly pushed out by property taxes and house-hunting in Riverdale." No, that's not how affordability crunches happen. New residential developments rolling out, do not make housing less affordable. In fact, they do the opposite. Rising residential demand from any number of factors (preference for less time in traffic, proximity to new amenities like the Beltline, proximity to new restaurants/stores etc. ), leads to affordability crunches. Meanwhile as new housing developments get rolled out, they ameliorate such crunches. Rather than lamenting luxury construction, these writers should be championing luxury construction as a deterrent from the displacement they are so worried about. The reason is this: by decreasing demand for older units, new luxury construction lowers rents for the existing housing stock. The theory is simple. When a new building opens, it attracts some residents from older places nearby and because there is less demand for their units, those places charge rents that are lower than they would be in the absence of this new construction (note that this doesn't mean rents necessarily go down at older places, they might go down sometimes, but they certianly end up lower than they would in the absence of new residential construction). So, given this wrinkle, what really matters is changes in the distribution of rents, not changes in the mean rent. It is entirely possible for mean rents to rise substantially without any displacement occurring as long as housing options aren't lost on the left side of the distribution. Indeed there is evidence of this phenomenon is occurring here in Atlanta. A recent BisNow article reports, "While rents shot up another 10 cents/SF on average to $1.76/SF...same-unit rents actually slipped nearly 4% year-over-year." So what is happening is this: new developments are opening at above-average rents (luxury units, raising the mean), and attracting at least some tenants who would have otherwise chosen nearby existing multifamily units. As a result, those existing multifamily units are getting cheaper, lowering their prices to stay full. In other words, not only is luxury construction not leading to displacement, it is actually preventing displacement. It is keeping our city affordable. It would be a shame to see a plan like this one derail luxury construction's role in keeping Atlanta affordable. I worry that a misunderstanding of housing markets on the part of both the press and politicians may end up leading Atlanta toward less affordable housing, despite hopes for more. Update (1/24/16): commenters on reddit point out that Atlanta had high levels of mortgage fraud before the recession, which inflated home values. This happened in both low-income and high-income neighborhoods. Lax lending rules intended to increase home ownership rates were partially responsible for this problem too. Nice article. I learned some new things. Thanks for sharing.  Great post, I liked it and enjoyed reading it, Thanks for sharing this useful and valuable information. My real estate agent from Dove mountain is a combination of being a nice, down to earth guy while being completely professional, and competent in every way that one would want from their property manager.